We were discussing various basic concepts of thermodynamics such as thermodynamic state, path, process and cycles in our previous post. We have also discussed the concept and method of calculation of work energy transfer in thermodynamics in our recent post. Today we will see here the concept of heat energy transfer and calculation in thermodynamics. We will study here the basics of heat energy in the field of thermal engineering and also we will see further the sign conventions used for heat and work transfer in thermodynamics. Heat energy is basically defined as the transformation of energy from one object to other object due to temperature difference. Heat energy will be transferred from high temperature object to lower temperature object. Heat energy transformation in a condition of thermal equilibrium will be zero. Heat energy will also be measured in joule and its unit of measurement i.e. Joule will be indicated by J. Transformation of heat energy will be done by following methods as mentioned here. Even we will see each method of transformation of heat energy in detail in our coming posts, let us understand briefly above methods of transformation of heat energy. If an object having higher temperature comes in contact with another object having at lower temperature, then heat energy will be transferred from higher temperature object to lower temperature object by the conduction method. Higher temperature object will lose the heat energy and colder object will secure the same quantity of heat energy and this process of transformation of heat energy will be stopped once both objects will come to a common temperature. Calculation of heat energy transfer by conduction mode will be followed by above formula. Heat energy transformation through a medium will be done by the process of convection method. Heat transferred through a liquid or gas will be the best example of convection method of heat transfer. Heat energy will be taken by convection current from one place to another place. Radiation is also one mode of heat energy transfer from one object having at higher temperature to another object at lower temperature by the electromagnetic waves or radiation. Radiation mode of heat energy transfer does not require any substance for traveling from one place to another place. Electromagnetic radiation or waves will travel through the vacuum of space. We are securing heat energy from sun by radiation mode of heat energy transfer. Let us see the meaning of symbols used in above formulas for determining the heat energy transfer by above mentioned three modes of heat energy transfer. 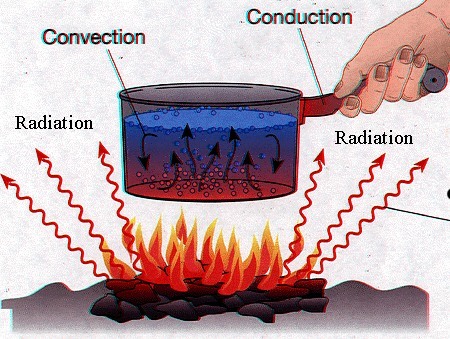 As displayed in figure, water is being heated in a pan by burning coal. Heat energy transfer from burning coal to the bottom of the pan will be done by radiation mode of heat transfer. Heat transfer from the hot water at the bottom of pan to the cold water at the top of the pan will be followed by convection mode of heat energy transfer. Heat energy transfer from the body of the pan to handle of the pan will be done by the conduction mode of heat transfer. We will discuss the sign conventions used for heat and work transfer in thermodynamics in our next post. Memory tricks and why they work?